Fennel roots develop from the perennial non-bulb-forming Fennel variety, which produces longer taproots and little to no bulb. Herb Fennel is grown for its foliage, which can grow up to eight feet tall, and its seeds, which are used in a variety of ways all over the world. The roots of “bronze” Fennel develop underground, and can have multiple off-shoots which can be removed and replanted for future propagation. The Fennel roots are white and spindly, resembling baby parsnips. Young Fennel roots can be scrubbed with a firm brush; more mature roots require peeling. Fennel roots are available year-round, with peak season during the winter months. Fennel roots come from the “bronze” variety of common Fennel, botanically known as Foeniculum vulgare var. “rubrum”. Primarily grown for its herbaceous fronds and aromatic seeds, it is the Bronze Fennel and not the Green Fennel that is desired for its licorice-flavored seeds. The roots are entirely edible and offer the same sweet and savory anise flavor of the rest of the plant. Roots are best harvested when young because they can become hard and fibrous with age. This variety is different than the Foeniculum vulgare var. “dulce” which is grown for its bulbous stem and is considered a vegetable, versus the “rubrum” variety that is known as the ‘herb variety.’ Fennel root is also known as Sweet Fennel and Bronze Sweet Fennel. Fennel is rich in phytoestrogens, which benefit the body by helping with any female-related issues, respiratory problems and digestion. Fennel helps to relax the smooth muscle lining of the digestive tract and helps expel gas. The seeds are often used as a breath freshener and digestive aid. Though the bronze and green foliage of the Fennel plant is most often used, the stalks, leaves and the root of the Bronze Fennel plant can be used. The taproots can be diced and roasted with other root vegetables. Boil the root and puree when softened, for use as an addition to soups as a thickener or to be used as a garnish on plates. Bronze Fennel leaves pair well with French tarragon, matching the sweet and spicy flavors, respectively. Steep the leaves and root in milk to be used in ice cream or other baked goods. The root and leaves can be used as aromatics, flavoring liquids and beverages. Fennel roots should be removed from the small stalks and leaves for storage if the intent is to use both. Fennel is an important garden herb, because it attracts bees and butterflies, our primary pollinators. Fennel is a valuable host plant for the Anise Swallowtail and the Eastern Black Swallowtail butterflies. In the Middle Ages, Fennel was thought to have the power of strength and its flowers and leaves were hung over the front door to ward off witches. Fennel is native to Europe and was widely used in the Middle Ages. Sweet Fennel was used by the Romans who called it “fenicularius” and were predominantly responsible for its spread and subsequent use throughout Europe and Asia. Bronze Sweet Fennel came to the western coast of the United States from Spanish explorers, eager for the flavors of home. It can be found growing wild along the coast of California and up to Canada. 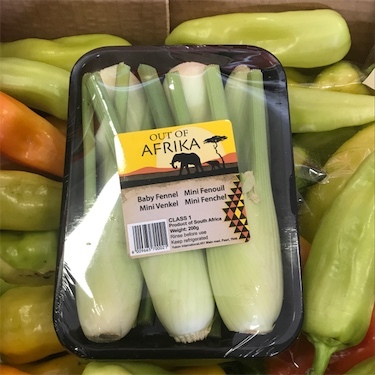 Someone shared Fennel Roots using the Specialty Produce app for iPhone and Android.